Just because I'm gluten free doesn't mean I can't enjoy dishes made with flour. I just have to adjust things a bit by using different flours to get my fix. For these crepes, I used an all purpose gluten free flour, such as Tom Sawyer brand. What's nice about this specific brand is that the ingredient xanthan gum is already incorporated. Xanthan gum is important in dishes because it helps as a binder in place of the gluten. Another brand that also has xanthan gum incorporated is Better Batter. Either of these work well in the following recipe. If you don't have these brands available, use your preferred gluten free flour and add 1/2 teaspoon of xanthan gum to the recipe. In a blender, combine all of the batter ingredients and pulse for 10 seconds. Place the crepe batter in the refrigerator for 1 hour. This allows the bubbles to subside so the crepes will be less likely to tear during cooking. The batter will keep for up to 48 hours. 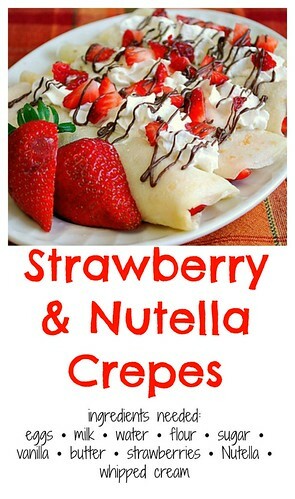 Taking one crepe, spread a tablespoon of Nutella down the middle of the crepe. Top the Nutella with chopped fresh strawberries. Fold the sides over the filling and carefully lay seam side down on a serving platter. 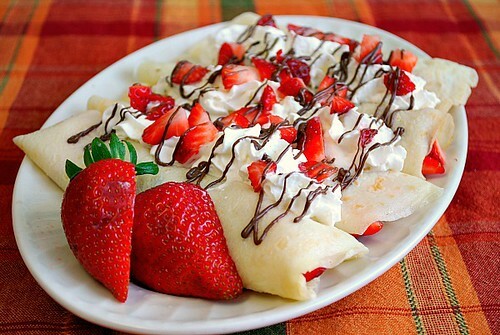 Top with whipped cream, a sprinkling of more chopped strawberries and a drizzle of melted Nutella over the top. These look incredible! I just want to just in and grab one. This looks like something I could make with my kids at school and we could fill with just about anything. I love that you are having GF recipes, as a few of my students are on GF diets. Thanks! I am definitely going to make these this weekend! Cheers! These look wonderful. This recipe would be a great Sunday morning treat! your crêpe recipe looks very testy.i do not wait for this. Anonymous - please note that the link is to Foodnetwork.com in which the recipe is from Alton Brown, as credited appropriately and noted the recipe I'm sharing is adapted from the link before the recipe is provided. Please also note my recipe above is for Strawberry Nutella crepes with a specific filling whereas the Alton Brown recipe is just for the crepes. It is actually a nice and helpful piece of information. I am glad that you shared this useful info with us.